Travel for 3 hours or for 3, 4 or …12 days alongside glacier-fed lakes, majestic mountains and ferocious rivers. The never ending scene of virtually untouched wilderness, right out your window. 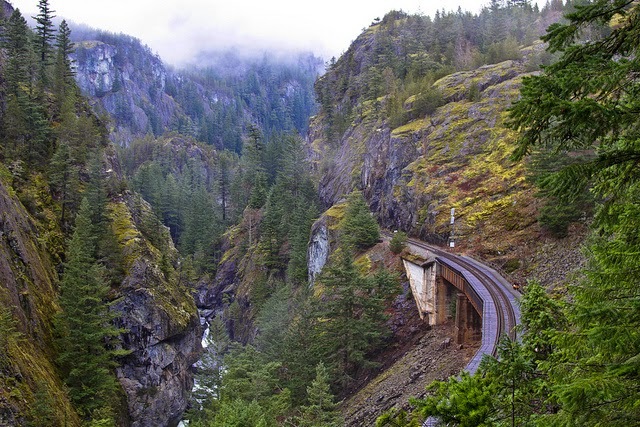 This part of the world is ideal train travel. Mountain vistas, lake, roaring rivers, flowery meadows, waterfalls and wildlife all await discovery. 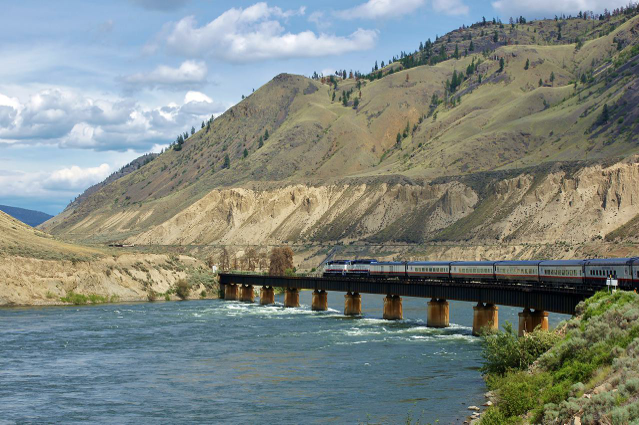 Rocky Mountaineer offers over 65 train packages including on that goes from Vancouver to Alaska and from train to cruise ship. The scenery is so amazing that the train company guarantees the train windows are cleaned daily. These are not budget traveler experiences. Trips rage from a couple hundred dollars for a 1 day excursions to over $6000 per passenger for 12 days, but saving up for this experience is well worth it. A couple great examples are the First Passage from Vancouver to Banff (4 days $1,121 USD) traces the westward steps of 19th century explorers between Calgary and Vancouver and Sea to Sky Climb (1 day $274 USD) travels from the coastal city of Vancouver to the resort town of Whistler, renowned for outstanding skiing and year-round outdoor activities. Highlights of the trip include spectacular views of Howe Sound and the Coast Mountains, Brandywine Falls, Mount Garibaldi and the impressive Cheakamus Canyon. Whatever you choose, you want be disappointed. Canadian train travel is a great way to go.